INTER-OFFICE correspondence is shunted about from one. floor to another with lightning-like rapidity, thanks to the pneumatic-tube system of transferring messages, recently installed in the new skyscraper of a New York insurance company. The various tubes shown in the photo below lead to different offices in the building. 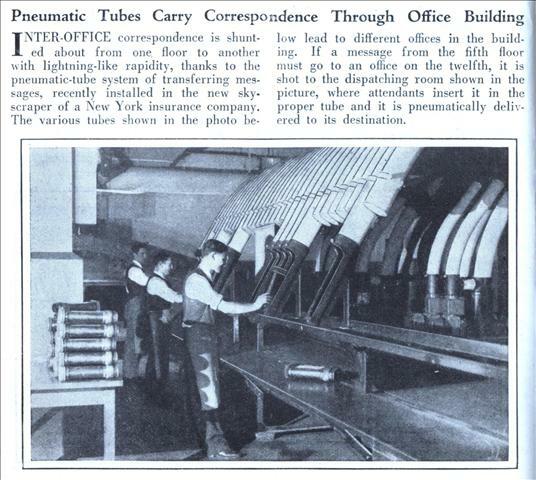 If a message from the fifth floor must go to an office on the twelfth, it is shot to the dispatching room shown in the picture, where attendants insert it in the proper tube and it is pneumatically delivered to its destination. When I was a kid in the 50’s in small town Delaware, the local department store used the tubes for payment. You selected your items and went to the department’s counter. The bill and your money were magically carried away to some mysterious cashier deep in the dark recesses of the store, and in a few minutes, the tube came zipping back with your change. PoppyJoe, I remember something similar in New York state. I was too young to remember the details but I remember being amused and following the trail of tubes to the second floor. I am not sure if it was for special transactions, or all transactions. 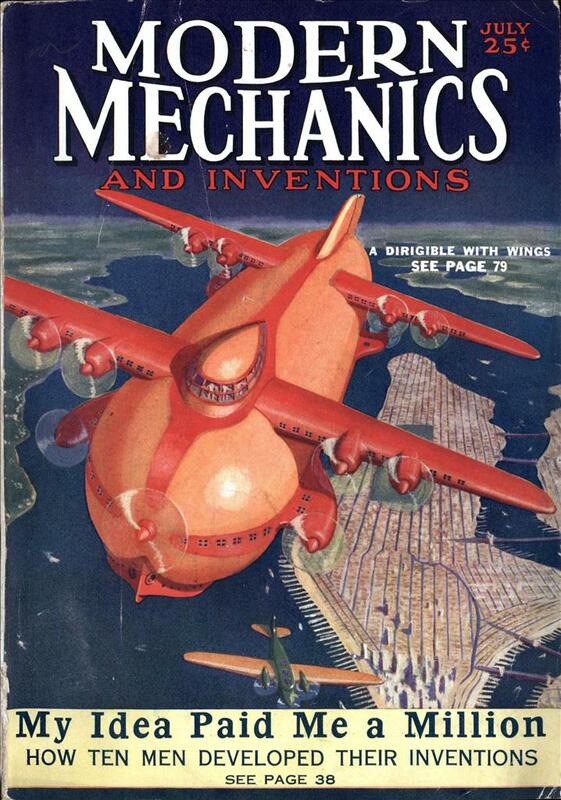 And the richer companies had wider pipes that could handle multiple messages at once. (I remember a local store that had a similar system but it was driven by cords over pulleys. @PoppyJoe: Pneumatic tube systems are common in some big-box retailers; I know (at least here in Phoenix), they have them at the Home Depot stores, the Lowes stores, and the Costco stores. I think they use them mainly for change requests (when the cashier needs more dollar bills or coin rolls for their till). Pneumatic tube systems are also common in hospitals, where they’re used to transport samples to the lab and drugs to and from the pharmacy. One hospital I know also uses them to send containers of used sharps to a centralized disposal. I saw most of those images on the wallpaper of the like named sandwich shop. Thanks for the cash railway link. My dad is a banker and, when I was little, I’d spend hours playing with the teller tubes when I’d stay there after school. And yes, I certainly wondered why we didn’t have them in the home! I worked in a room like that at the old University of Michigan hospital (long ago razed and replaced), when I was in high school back in the 1970s. Mostly they used the tubes for medications and for sending out the daily patient census. It was stupefyingly boring after the novelty wore off, except for fooling around with the high pressure hose that was used to clear blocked tubes. Sux to lose your job to email.